Simplification. . .the art of editing. . .a sense of ease. . .aspirations of intention and effortlessness. There is beauty in substance. As a creative, I gravitate towards clean lines, simple geometries and negative space. As an entrepreneur, I invest in being efficient without compromising life-giving moments. This is an all year round approach for me and simplicity with great substance is intuitive and a daily practice. Due to this being a season filled with extremes—extreme spending, excessive schedules—I am wanting to share a little visual relief along with a simple centerpiece idea for you and your families for the holidays! You all do so much and I am talking a ONE STOP grocery shop for your centerpiece decor and holiday meal planning!!! Yep, it is that simple. No more Pinterest fails here, or complex inspiration holiday tables. For me and my schedule, keeping it simple, classic and achievable is KEY! 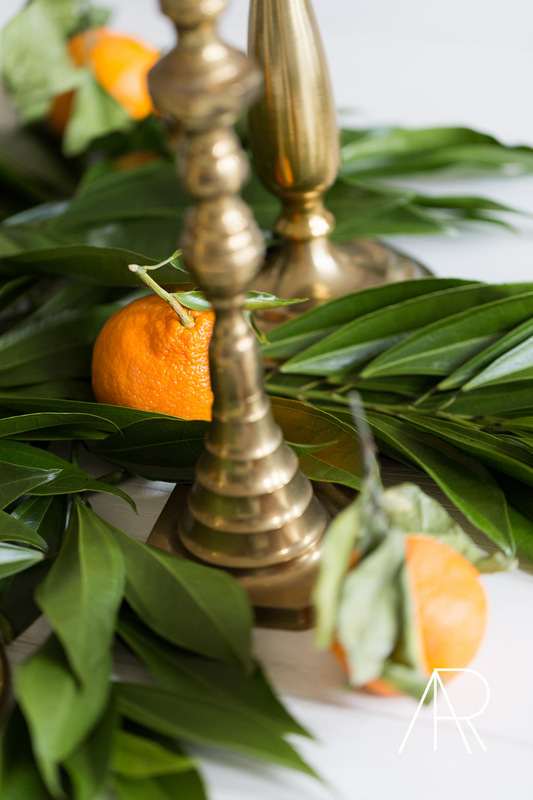 My thoughts about holiday decor: I love organic elements and the best way to decorate for the season is through fruit and greenery. The middle of your table is an incredible opportunity for a beautiful flat lay in addition to candlesticks!! Think about color and scale. 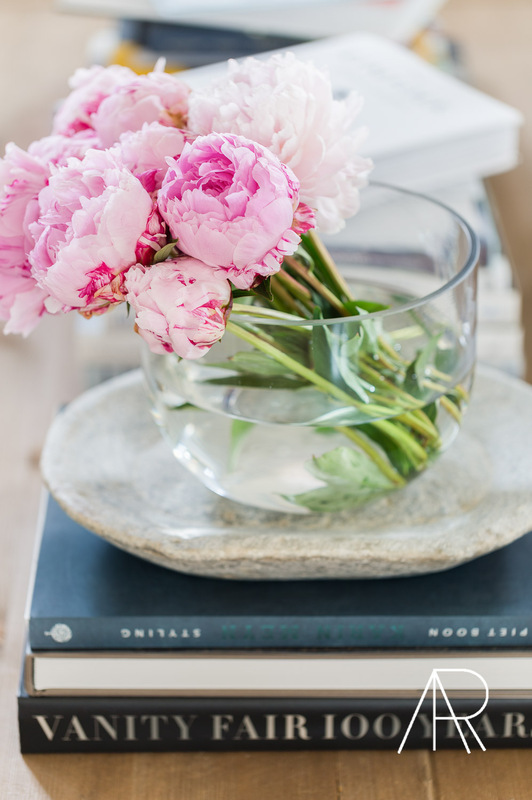 My home is light, bright and airy; I love incorporating fun pops of color with art and florals. My grocery store had the most perfect shade of pink peonies and I scooped them up along with these beautiful clementines! Great color combinations for your table also include Bosc pears/greenery/with cut orchids….. I encourage you to experiment!! Also, think about scale and composition. For centerpieces, a visual high / low is important. Visually this keeps your eye moving around… the candlesticks on my table help achieve height while the greenery and buds ground the center of the table. The focus is on company and conversation and with my easy breezy centerpiece, it allows for some room to breathe and will not compete with our table talk!! Filler—My favorite types of filler to style with for a flat lay are any type of fern leaves, seeded eucalyptus, Nageia Nagi, Jade Palm, Eucalyptus Silver Dollar. . .Hello Filler is the New Floral!! Arrange candlesticks first—the more the merrier. Arrange the flat filler over and around the candlesticks to create a good base; stems go in towards the middle. Sprinkle conservatively with fruit and flowers. For a little extra extra, you can add fresh basil leaves or rosemary to appeal to all the senses. Start a New Tradition: For me this was an easy one, I haven’t ever had a tree until this year. I am Jewish and I am looking at it as more of a symbol of love and acceptance… Since this was our first tree and I do not have ornaments… I incorporated a very New Southern approach and made this tree our own! I love soft linens and silk velvet bows. I styled beautiful linen and velvet bows all over the tree…… HELLO RIBBON IS THE NEW ORNAMENT!!!! #TheNewSouthern - This was easy, economical and delightful while assembling with Tony Bennett and Lady Gaga playing in the background! Give yourself a Gift of Service…. This is being of service to yourself (Ask yourself what you need? More rest? More Relaxation? More time? and give it to your self… this is a form of love and you have my permission to give yourself the gift of rest or stillness if you need it) AND this is being of service to others! Connect with your local shelters / community youth programs and see how you can give your time and energy to another human who is in need of your love and warmth.